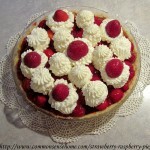 Strawberry-Raspberry Pie - Tastes Like Summer! Strawberry-raspberry pie is one of my favorite pies, and my husband and boys agree. When I served it up as part of a dessert raffle for the local Junior Women's Club, the winners said it was the best pie they'd ever eaten (and ordered five more pies for a family gathering – that was a *lot* of pie baking). This pie has a not-too-sweet sugar cookie crust filled with fresh strawberries in a strawberry-raspberry puree and topped with sweetened whipped cream. It's decadent, but delicious. You can use all strawberries if you don't have raspberries on hand, or use frozen (thawed) raspberries. 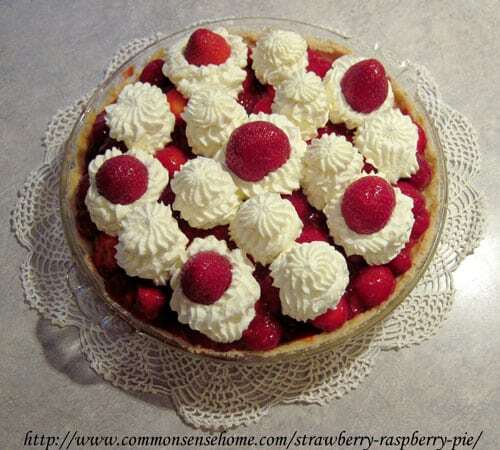 The strawberry-only pie is very good, but the raspberries mixed in add “just a little something”. You can use this recipe to make a smaller, neater, 9 inch pie that can more easily be served in slices, or to make a heaped up monster 10 inch pie that needs to be served in bowls. 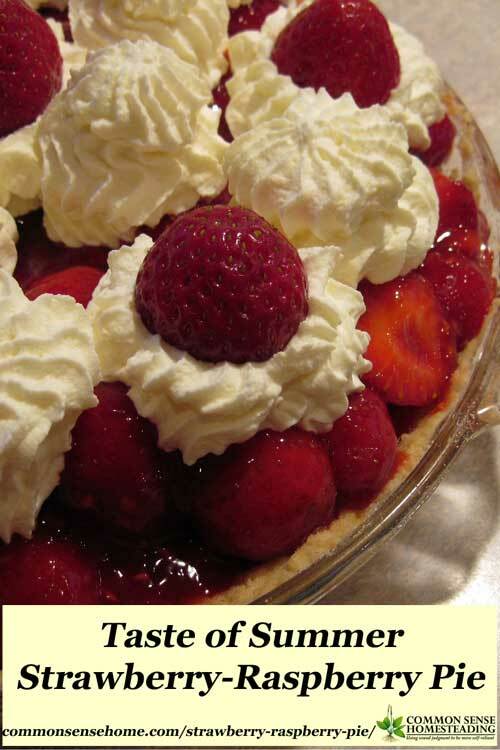 Just use the amount of berries noted for each size pie plate. It will take a while for everything to cook and chill, so plan to start this pie several hours before serving. 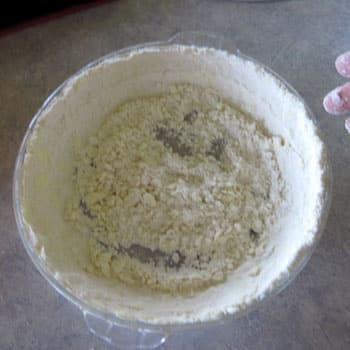 For crust: Cut together butter, sugar and flour with a pastry blender to form pea sized bits. Press into a pie plate (preferably glass). If you use a 9 inch pan, you will have a thicker, more cookie-like crust. 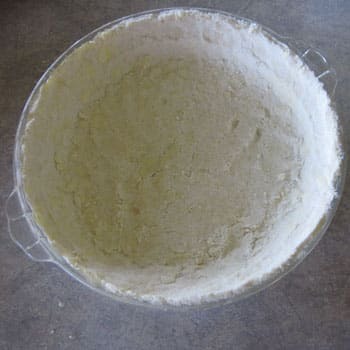 If you use a 10 inch pie plate, it will be spread thinner and be more crumbly. When pressing a crust into a pie plate, start with the edges, then press the remaining material into the bottom. (Yes, you could substitute a store bought cookie crust or graham cracker crust, but this is really easy once you get the hang of it, and far tastier than purchased equivalents.) BTW, if you don't have a pastry blender, you can use a fork, or pulse the mix in a food processor. Don't overmix or you'll make the crust tough. 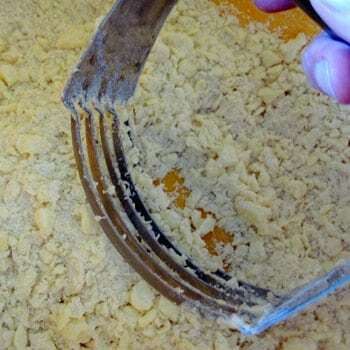 If you're going to buy a pastry blender, get a sturdy one with blades, not wires. You'll thank me when you're cutting up cold butter for pies or biscuits. Bake at 325 degrees F for 15-18 minutes until lightly brown. Allow to cool to room temperature before filling. For Filling: In a small sauce pot, simmer 1/2 cup mashed strawberries, 1/2 cup raspberries and 2/3 cup water for 3 minutes. In a small bowl, blend sugar and cornstarch, then add remaining 1/3 cup water and mix into a slurry. Pour sugar/cornstarch mix into berry mix on stove. Bring to boil, stirring constantly. Boil one minute. The color of the mix will turn from dull to glossy. Set aside to chill. Room temperature is okay, refrigerator temperature is better. Don't pour hot filling over your berries or you'll end up with a big, sloppy mess. While the cornstarch mix is chilling, prep your berries. Rinse berries in a colander if they are dirty – never soak your berries to wash them. (They act like sponges.) Place berries on a kitchen towel and pat dry. (Too much moisture will make your pie runny.) Remove the hulls. If the berries are small, you can leave them whole. Larger berries may be sliced. Sliced berries tend to make a neater pie. Whole berries save time. Your choice. It's all good. When the cornstarch mix and the pie crust have cooled, you can assemble the pie. Place berries in a large bowl and pour cornstarch mix over the top. Toss berries gently to coat, then scoop into pie crust. You could also just put the berries in the pie and pour the sauce over the top, but for me, pre-mixing works a little better. For Topping: Pour whipping cream into mixer. Beat just until soft peaks begin to form. Add vanilla and powdered sugar. Whip until it reaches stiff peak stage. Apply to top of pie with a spoon or spatula, or you can get a little fancy and use a pastry bag with a large star tip. To more easily fill your pastry bag, prop it up in large glass. It takes a couple minutes more to use the bag, but I think it adds a nice touch. 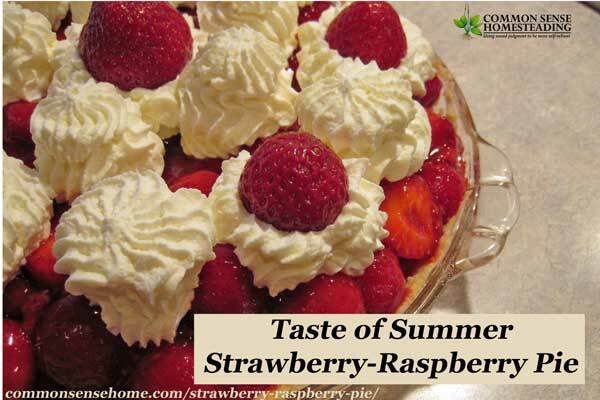 And there you have it – one strawberry-raspberry pie that tastes like a slice of summer. This is the 10 inch option with most of the berries left whole. Makes eight servings. I hope you family enjoys this recipe, too. Don't forget to Pin and Share. A delicate shortbread crust pairs with juicy raspberries and strawberries for a decadent but delicious summer pie. For crust: Cut together butter, sugar and flour with a pastry blender to form pea sized bits. Press into a pie plate (preferably glass). If you use a 9 inch pan, you will have a thicker, more cookie-like crust. If you use a 10 inch pie plate, it will be spread thinner and be more crumbly. When pressing a crust into a pie plate, start with the edges, then press the remaining material into the bottom. For Filling: In a small sauce pot, simmer 1/2 cup mashed strawberries, 1/2 cup raspberries and 2/3 cup water for 3 minutes. In a small bowl, blend sugar and cornstarch, then add remaining 1/3 cup water and mix into a slurry. Pour sugar/cornstarch mix into berry mix on stove. Bring to boil, stirring constantly. Boil one minute. The color of the mix will turn from dull to glossy. Set aside to chill. Room temperature is okay, refrigerator temperature is better. Don’t pour hot filling over your berries or you’ll end up with a big, sloppy mess. While the cornstarch mix is chilling, prep your berries. Rinse berries in a colander if they are dirty – never soak your berries to wash them. (They act like sponges.) Place berries on a kitchen towel and pat dry. (Too much moisture will make your pie runny.) Remove the hulls. If the berries are small, you can leave them whole. Larger berries may be sliced. 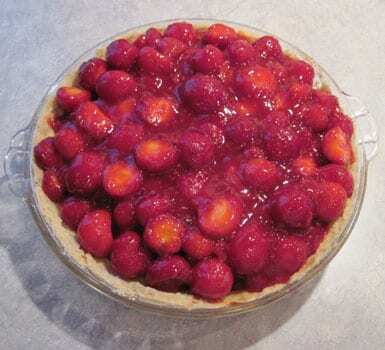 Sliced berries tend to make a neater pie. Whole berries save time. Your choice. It’s all good. When the cornstarch mix and the pie crust have cooled, you can assemble the pie. Place berries in a large bowl and pour cornstarch mix over the top. Toss berries gently to coat, then scoop into pie crust. For Topping: Pour whipping cream into mixer. Beat just until soft peaks begin to form. Add vanilla and powdered sugar. Whip until it reaches stiff peak stage. Apply to top of pie with a spoon or spatula, or you can get a little fancy and use a pasty bag with a large star tip. 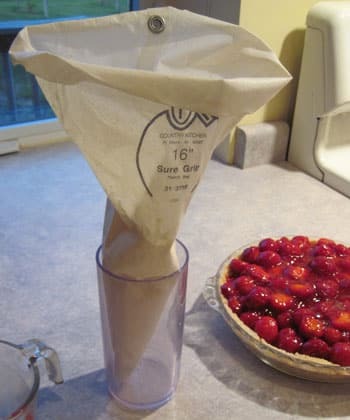 To more easily fill your pastry bag, prop it up in a large glass. It takes a couple minutes more to use the bag, but I think it adds a nice touch. Sounds wonderful! Can’t wait to try it!